Members of a U.S. Consumer Advisory Board say they plan to fight a recent decision that led to all of them being fired. Acting Consumer Financial Protection Bureau Director Mick Mulvaney announced this week that members of three advisory boards at that agency were fired. That includes members of the Consumer Advisory Board and the Credit Union Advisory Board. He says the decision to disband the groups was made based in part on costs and budget needs and a lack of diversity. According to a statement, the agency will continue the groups but make them smaller with all new members. It has been a requirement for the agency to meet with members of the Consumer Advisory Board twice per year, but Ruhi Maker, a member of the board and senior attorney at Empire Justice Center in Rochester, says that meeting was cancelled. She says overall she’s frustrated with the lack of concern she perceives the Bureau has for consumer protections. Before Mulvaney was made Interim Director, he was a Congressional Representative for South Carolina. He sponsored legislation to abolish the bureau and his confirmation in 2017 to the position was rather narrow. He was confirmed in a 51-49 Senate vote. In the statement released this week, the Bureau said it will beef up outreach and listen to concerns from consumers: "In addition to the advisory groups, the Bureau will increase its strategic outreach to encourage in-depth conversations, sharing information, and developing partnerships focused on consumers in underserved communities and geographies. These engagements will include regional town halls, roundtable discussions at the Bureau’s headquarters with consumer finance experts and representatives, regional roundtables, and regular national calls." (U.S. Edition) There's a leadership tussle happening right now at the Consumer Financial Protection Bureau, the watchdog agency created after the financial crisis. Outgoing Director Richard Cordray named longtime staffer Leandra English as his replacement, but President Trump has tried to appoint budget director Mick Mulvaney. On today's show, we'll recap the ongoing controversy. Afterwards, we'll discuss a leadership shakeup that's happened in another industry: John L. Flannery took the reins of General Electric this summer. 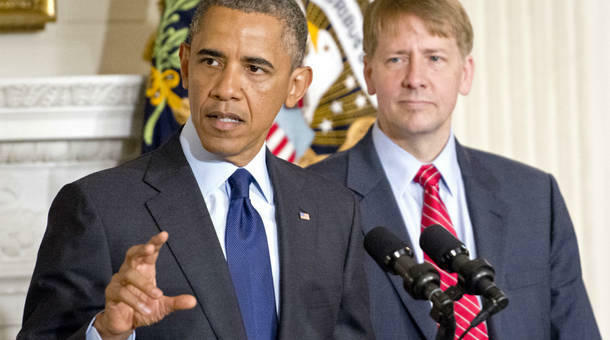 Richard Cordray announced today that he's leaving the Consumer Financial Protection Bureau by the end of the month. President Donald Trump will get to appoint Cordray's successor, giving him yet another way to reshape U.S. financial regulation. We take a look at how the president is putting his stamp on these regulations. Donald Trump's transition team promises to roll back some of the financial regulations put in place after the economic crisis. One regulatory agency whose future is uncertain: the Consumer Financial Protection Bureau. Mick Mulvaney, the acting director of the Consumer Financial Protection Bureau, has been on a mission to dismantle and reshape the agency. In his latest move, he’s targeting the student loan division. He’s folding that office, which is meant to protect student loan borrowers from any wrongdoing, into a different unit focused on consumer education. Think of it as a sort of downgrade, if you will. But what does the move actually mean, and how could it impact students?